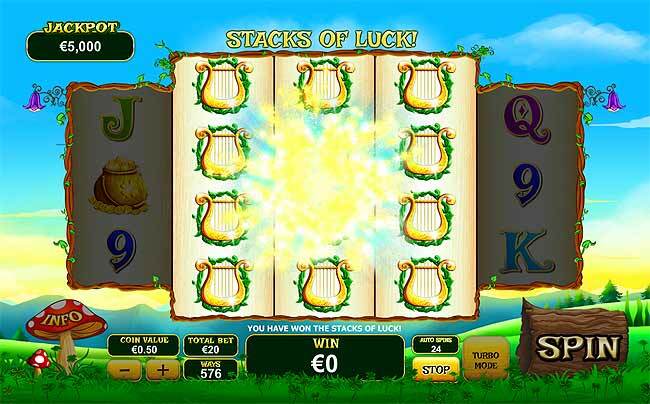 Every year, just before St. Patricks Day on 17th March all the big slots software developers roll out a new Irish themed video slot game. An Irish theme in video slots is very popular, maybe because of the Irish Luck, Lucky Irish or 4 leaf clovers or something, either way this is a good game, with and Irish theme and lots of luck!! When playing Land Of Gold you are trasported to the emerald isle and in for some big wins. This is a basic game with no fixed paylines. There are 576 ways to win with matching symbols appearing on adjacent reels. The reels have a different set up too. The two outer reels have 3 symbols and the three inner reels each show four symbols. The game also contains 3 exciting bonus features. Standard symbols in this game include 9, 10, J, Q, K and A, but also high value symbols include pot of gold, rainbow, four leaf clover, horseshoe and golden harp. In addition there is the leprechaun SCATTER symbol, the Land of Gold logo WILD symbol and the toadstool BONUS symbol. The first bonus feature is the STACKS OF LUCK bonus. The high value symbols can appear stacked on reels 2, 3 and 4. Get a matching symbol stacked on the three center reels to win an additional cash prize of up to 25x your total bet. 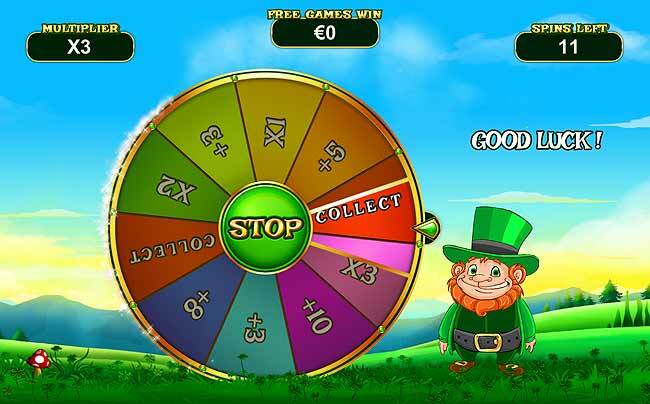 Spin 3 or more leprechaun SCATTER symbols and you activate the LUCKY FREE SPINS bonus. Spin the wheel of luck to see how many spins you are awarded and what the multiplier is. Free SPINS are topped up by getting more scatter symbols on reels 2, 3 and 4. Spin the BONUS symbol on reels 1 and 5 to start GOLDEN COINS bonus game. The leprechaun jumps from the toadstool and collects coins. Collecting 3 lucky clovers wins the jackpot. Hitting the crow end the bonus game and you collect your cash win. This is a fun game with the potential for big cash payouts. Click the "PLAY NOW" button below to play for real with a huge free spins and cash match welcome bonus.